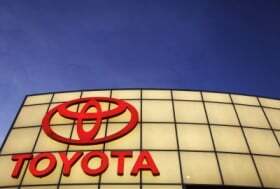 Toyota Motor Corp. has canceled planned overtime work at its car assembly and engine plants in the UK as automakers increasingly face component shortages following the earthquake and tsunami in Japan. Toyota's production disruption comes after Honda Motor Co. said it will cut production at its UK factory by 50 percent for seven weeks due to a shortage of some parts supplied from Japan. Toyota has canceled one hour per shift, four days a week for the 2,700 employees of its car-assembly factory in Burnaston, near Derby, England, and an engine plant in Deeside, Wales, that employs 500, spokesman Nick Freeman told Bloomberg News on Wednesday. The Burnaston plant, which last year produced 137,000 Auris, Avensis and Auris Hybrid models, suffered a supply gap of about one week through March 21, Freeman said. Parts from Japan make up 23 percent of the total by number and 7 percent by volume. Honda will cut output at the plant in Swindon, England, to half the planned weekly rate from April 11 through the end of May. Production will be accelerated once the parts shortage is eliminated and the site will still make the planned 135,000 cars this year, spokesman Paul Ormond said. "We've been relying on inventories to maintain production but the shutdown in Japan is now working through the supply chain," he said. Honda said March 31 that parts shipments would resume on April 4 as its factories recover from the magnitude-9 earthquake on March 11, with lines restarting at its Suzuka and Sayama plants in Japan beginning April 11. The Swindon site, which employs 3,000 people, built 139,000 CRV, Civic and Jazz models last year for 30 markets in Europe, the Middle East and Africa and has the capacity for 250,000 annually. Honda, Japan's No. 3 carmaker, has already cut output in the United States, Canada, India, Mexico the Philippines and Turkey. Production workers at the UK plant will each accrue 105 "banked" hours to be completed during the rest of the year once parts supplies are restored, allowing lost output to be "quickly recovered," Ormond said. Nissan Motor Co. said its biggest European plant in Sunderland, England, has yet to be directly affected by last month's earthquake, which left more than 27,000 dead or missing, with inventories making up for any shortfall in parts delivery. The site, which produces the Qashqai, Note and Juke models, built 423,000 cars in 2010, 80 percent of them for export, and has been Britain's No. 1 car plant since 1998, accounting for one in every three cars built in the country last year, Gloria Maydew, a spokeswoman said. It employs 4,900 people.